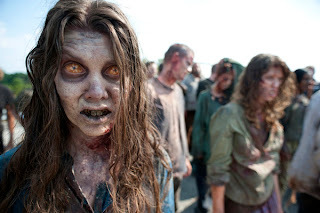 Zombies And Toys: Darabont Walking Away From The Walking Dead? Darabont Walking Away From The Walking Dead? Just days after the Season 2 trailer for AMC's "The Walking Dead" was unveiled to tremendous fanfare at SDCC, helmsman Frank Darabont has announced his departure from the show. Rumors and speculation abound as to the reasons for the sudden departure, and fans have begun voicing overwhelming concern for the future of the hit TV show. AMC hasn't made any official statements as to whether Darabont is walking away from the show entirely, nor have they announced a successor to fill his seemingly massive shoes. This news follows a winter plagued with differences between producer and writing staff, and reports that the director was having a hard time adjusting to the grueling schedule of television. For many viewers Darabont's cinematic style is what breathed life into the zombie drama, proving that the genre could captivate not just horror fans but everyone with a story about humanity and survival. We're sort of speechless. AMC has said that production is continuing as scheduled, so for now we'll have to hold our breath, cross our severed fingers and hope that the show does go on as brilliant as before. Season 2 of "The Walking Dead" is scheduled to premiere October 16th. I cant wait for the second season!! I hope AMC doesn't wind up ruining the show. The Walking Dead is one of the best genre shows to air on television in a long time, and I've been waiting all year for Season Two. I'll keep rotting fingers crossed that AMC doesn't screw this up.